SubAccounts provide the ability to enable groups of users to view and manage their own checks without giving them access to other users checks. This is designed organizations that provide NodePing monitoring services to your own customers in mind. For example, hosting providers can give their customers monitoring services as a part of their hosting service. This allows you to provide full monitoring services to your customers while still having the ability to manage their monitoring, help them if they have questions, shield them from other customers information, and maintain control. There is no additional cost for adding subaccounts to your NodePing account, and there is no limit to the number of subaccounts you can have. Paired with our Branding features, this can be a great way to provide monitoring for your customers. 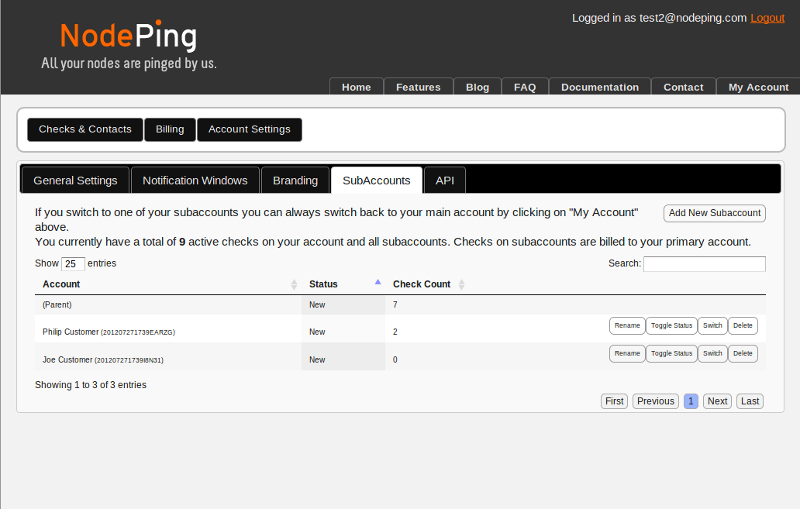 The subaccount management in NodePing allows you to manage all subaccounts from your own login. You can create new subaccounts, suspend or remove subaccounts, manage checks, contacts, and contact groups, and access all reporting in all subaccounts. 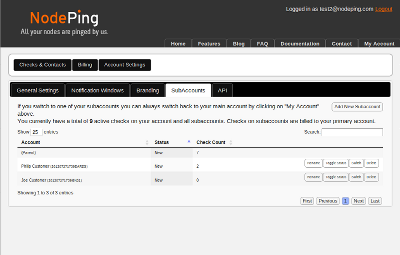 You can even switch to the subaccounts to see what your customer sees, which makes supporting them much easier. Adding new subaccounts is very easy. Just click the "Add New Subaccounts" button and fill in the basic information for the subaccount. The account is added immediately. To create or manage checks, contacts, and contact groups in subaccounts, go to the SubAccounts tab under Account Settings, and click on the Switch button next the subaccount you want to manage. To change back to your own account, you can click on "My Account" on the main navigation bar. Contacts subaccounts cannot have "owner" level access. All other levels of access ("edit," "view," and "notification only") are available. SubAccounts cannot themselves have their own subaccounts.